Practicing a good oral hygiene routine requires you to adopt habits that, when performed regularly in addition to other healthy oral care behaviors, can target plaque and bacteria in vulnerable areas of the mouth. Plaque can eventually lead to tartar, cavities, and more serious dental complications including decay. The use of dental floss is a core part of a healthy dental routine and a powerful tool in your arsenal to fight plaque between the teeth and below the gumline. Flossing is a proven method of removing plaque and bacteria from the teeth and gumline, yet few people maintain a daily flossing routine. Of those who have adopted a daily flossing routine, improper use of floss may reduce the overall benefits obtained. 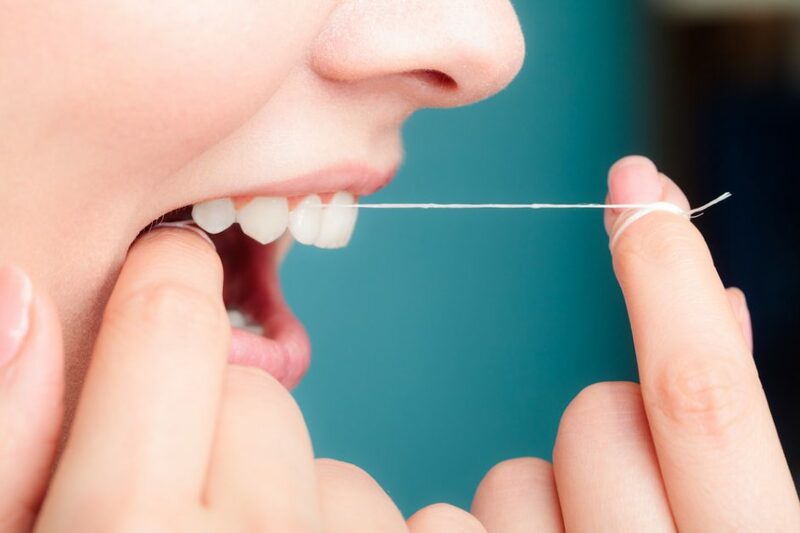 Flossing is important not only because it removes stuck food particles from between the teeth but because it can remove plaque and bacteria from the teeth as well, according to the American Dental Association. This dental plaque eventually leads to tartar, a hard mineral deposit that is difficult to remove and is a major cause of gum disease. Most toothbrushes cannot reach the tiny spaces between teeth, also referred to as interproximal areas. For this reason, it is necessary to clean between your teeth by adding dental floss to your daily oral care routine. The key to maintaining your daily flossing routine is to floss comfortably and correctly. Opening your dental floss container, remove and roughly measure a strand of dental floss at 18 inches. This is about a foot and a half. Holding the floss between your thumb and index fingers at each end, wrap it securely around your index fingers to hold it firmly in place. Without too much force, insert the floss gently between your teeth. Some new users find it is most comfortable to start with the lower teeth and others feel more comfortable starting at the upper teeth. Adjust your routine to the method that is most comfortable for you. Looping the floss around the surface of each tooth, move it gently between teeth using an up and down motion. Repeat this process on upper and lower teeth until all surfaces have been covered, using a new piece of floss for each row. If you experience sore or bleeding gums, discontinue flossing and schedule a consultation with Gentle Care Dentists. Our professionals can advise you on your routine. Never reuse floss. Discard immediately when finished. For an extra clean feeling, try using an interdental brush to reach the tiny spaces between teeth your regular toothbrush won’t. Flossing is a critical part of your oral care routine, and it’s never too late to start. Adopting a regular flossing routine now can aid in the prevention of cavities and periodontal disease later on. Call us today for more information on flossing and other dental essentials.